Steamed pita bread is my contribution to the world of fusion cuisine. An Asian recipe with Greek fillings…read on. Steamed pita bread. This is my contribution to the world of fusion cuisine. And I’m calling it “Grasian”…a combination of Greek and Asian! Do you think it will catch on? I’ve taken liberty with a bao dough recipe and turned it into pita bread. So, how did I find myself down the path of creative fusion cooking? 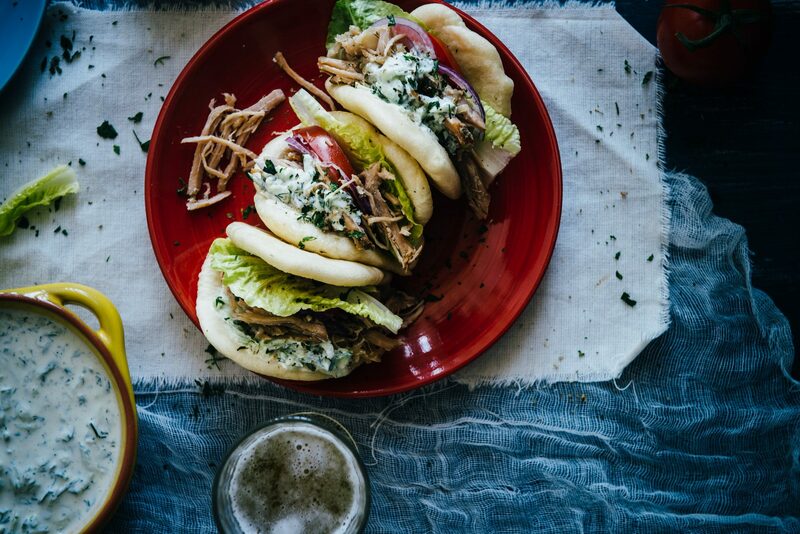 I initially had experimented with bao buns and filled them with leftover Greek style roast lamb. They turned out just OK.
What I realised was that getting those buns to look like they do at my favourite Chinese restaurant is a dedicated art requiring a lot of skill and practice. And don’t get me started on steaming. That’s a whole other world. So in the end, I went with my gut instinct and it worked! I filled my steamed pita bread with a slow cooked shredded pork, cos lettuce, onion slices, tomato and tzatziki. Major score! I think they are quite versatile and would work well with lamb, chicken or fish. I’m not going to brag (but I will!) but every single bite was a harmonious blend of perfection. I’d love to know if you’ve experimented with any fusion cooking of your own. Scroll down for the steamed pita bread recipe. 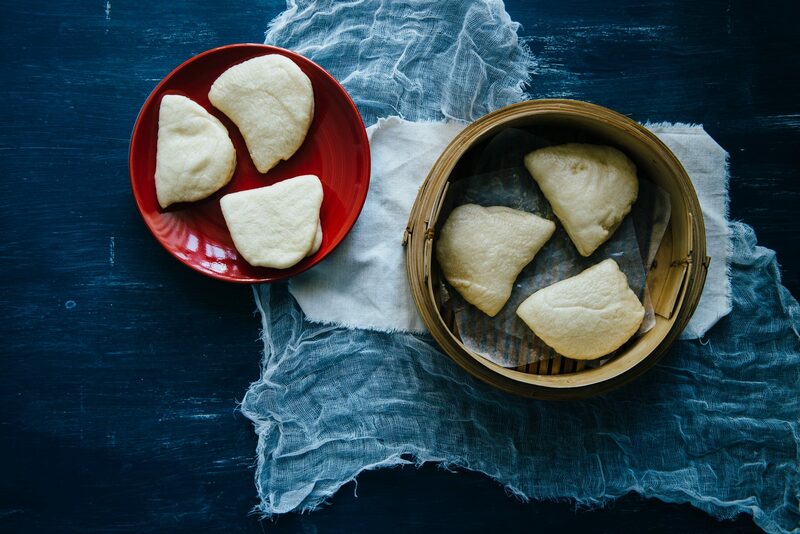 Taking inspiration from bao buns I've made steamed pita bread. Light and incredibly soft these bring new meaning to Greek cuisine! Combine the yeast, water and olive oil in a large jug. Whisk and set aside for ten minutes. In a large bowl combine the sugar, baking powder and 3 cups of flour. Make a well in the centre and add the yeast mixture. Work everything together until it forms a mass of dough. Work the dough until it becomes smooth and silky. If the dough is either too sticky or too dry adjust by adding an extra tbsp of flour and water to achieve the right consistency. Knead the dough for approx. 10 minutes,place in a well oiled bowl, cover and allow to rest for 1 hour until doubled in size. Remove the dough and punch it down with your fist. Divide into two logs. Roll the logs out and cut each log into 6 equal sized portions and roll into a ball. (a little larger than a golf ball). Place the 12 balls of dough on a tray with baking paper, cover and allow to rest for 45 mins. To shape the pita bread, take a ball of dough and roll out into an oval shape using a rolling pin, approx. ¼" thick. Spray the dough with olive oil and using a chopstick place it in the centre of the oval, fold it in half then pull the chopstick out. Repeat for the remaining balls of dough placing the breads on a baking tray with baking paper. Allow them to rest for 30 mins before steaming. To steam the pita breads, fill a medium to large wok with 2 cups of water. Allow the water to come to a rolling boil. Reduce the heat to medium. Place a bamboo basket (lined with baking paper and sprayed with olive oil) over the wok and steam the pita breads for 10 mins. (My basket fit 3 pita breads at a time). Once cooked allow them cool slightly before filling them with your desired meat and salads.